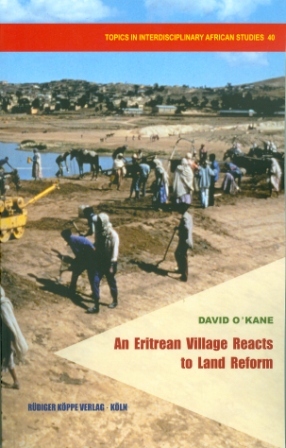 An Eritrean Village Reacts to Land Reform examines the roots of the Eritrean government’s land nationalisation policy – decreed in 1994 but never fully implemented – and the reactions of members of that community to that policy. Those reactions were sceptical, even though the people of this community had adopted the Eritrean national identity offered to them by the new state. 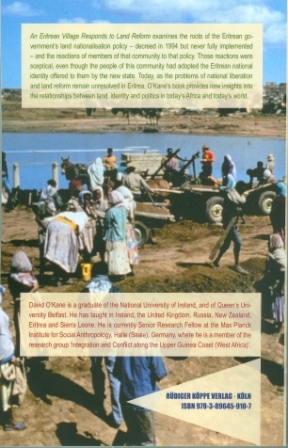 Today, as the problems of national liberation and land reform remain unresolved in Eritrea, O’Kane’s book provides new insights into the relationships between land, identity and politics in today’s Africa and today’s world. David O’Kane is a graduate of the National University of Ireland, and of Queen’s University Belfast. He has taught in Ireland, the United Kingdom, Russia, New Zealand, Eritrea and Sierra Leone. He is currently Senior Research Fellow at the Max Planck Institute for Social Anthropology, Halle (Saale), Germany, where he is a member of the research group Integration and Conflict along the Upper Guinea Coast (West Africa).